Here are 5 Best Free Antivirus Software that protect your PC from viruses, and other malicious software. There are many popular paid antivirus software available, but there are many good free antivirus too. 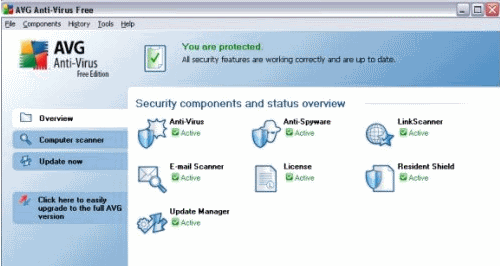 Here are some of the popular free antivirus that you can try. Couple these with a good free firewall, and you have taken most important steps towards securing your PC. 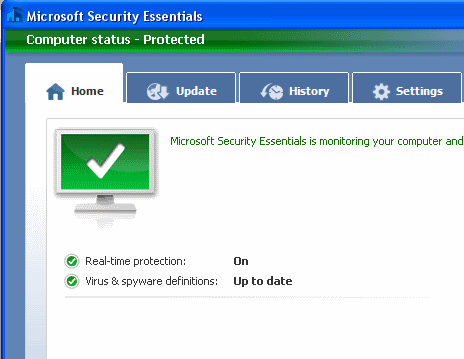 Microsoft Security Essentials (MSE) provides real-time protection for your home PC. MSE offers the latest technology to protect your computer against viruses, spyware and other malware, adding antivirus, rootkit and Trojan scanning capabilities. MSE is very easy to install and operate. The interface is very clean, simple, and uncluttered, without excessive, confusing options. There are four tabs, with compact labels: Home, Update, History, and Settings. From Home you can run: a Quick Scan, a Full Scan, or a Custom Scan, and change the scheduled scan. In the Settings window you can schedule scans, toggle default actions, adjust real-time security settings, and create white-lists. However, there are also some advanced options to exclude files by ‘type’ and ‘location’ as well as customizable alert actions. When the MSE icon is GREEN, you are protected and your status is good. That’s all! There are no irritating alerts. MSE runs quietly in the background, using minimal system resources. MSE automatically updates once a day. It features a new technology called Dynamic Signature Service which checks for the latest virus signatures when it detects a potential threat. Independent testing firm AV-Test GmbH conducted tests on MSE with common viruses, bot Trojans (virus used for theft) and worms, in which MSE detected and treated all malware, coming ahead of other antivirus software, and MSE also came out with flying colors in false positives testing. MSE is is our favorite free antivirus. The only pre-condition of Microsoft is that your system undergo Genuine Microsoft Validation Check when you select “Download” of MSE. Download here. AVG Free provides a good free antivirus option, that is one of the most popular free antivirus. AVG provides sufficient needs of minimum security through combined antivirus and anti-spyware engines. AVG Free 9 has faster scan and boot times. One new feature is the Identity Theft Recovery Unit, but for US users only. A slider facilitates choosing Slow, Automatic, or Fast scans: the slower the scan, the more comprehensive it is. If a virus is indicated, AVG creates a rescue disk to scan your computer in MS-DOS mode. The Link-Scanner feature scans links and gives you advanced protection from third-party malware before the page loads in your browser. The program doesn’t burden your system when scanning or during background run, although it slows down booting time, and takes time to shut down. AVG isn’t the fastest or most efficient, but it delivers the goods. Download AVG. Avira’s AntiVir is a popular and compact freeware antivirus solution. It not only protects against many types of malware, but also provides real-time protection. With AntiVir Guard, it removes viruses and repaires the system automatically in case of an infection. Immediate update of the virus database during installation, enabling a thorough full system scan immediately. The interface is not the most elegant, but it is functional. Navigation tabs are on the left in the main window, and there is a central pane to see more detailed information. 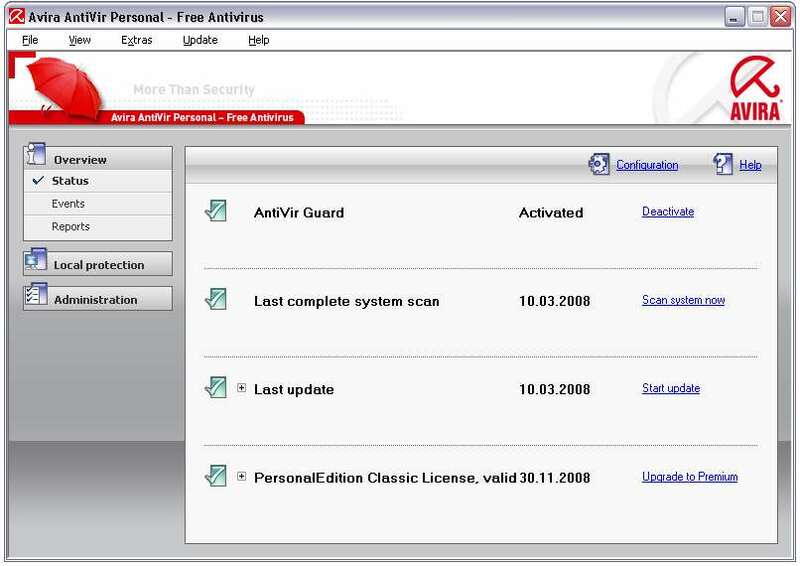 AntiVir opens with the Status menu displaying details of the last scan, the last definition file update, and whether the real-time guard is active. The Events screen logs program changes, and the Reports tab maintains the history of threats – both sections’ information being exportable. A pop-up window shows the scan-progress. 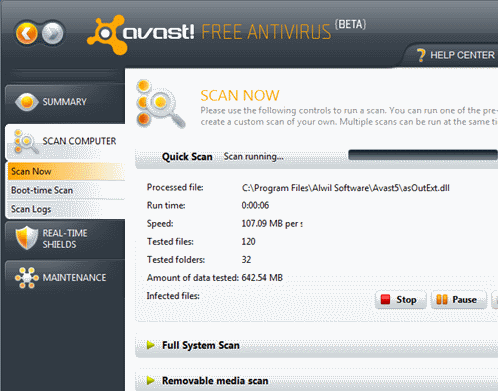 Unlike other Free antivirus software, AntiVir scans for rootkits. You can pause, stop, and resume a scan. As with any anti-virus program, there is a noticeable performance-lag during scanning. It can be scheduled to system-scan during off hours. You can choose a daily, weekly, or monthly schedule and time for the scan, and even for “off-hours”. Scanning display can be Maximized, Minimized, or Invisible. Also you can have your computer shut down after the scan to save power. AntiVir gives you a detailed text-based report for all scans and updates. Detection of a virus is accompanied by detailed, handy information from the Avira database. You can know the threat-level of malware, specific removal instructions if necessary, or determine it is a false positive. A pop-up nag-screen appears during update, a small price to pay for this Free, efficient antivirus software. Download Avira. Panda Cloud Antivirus is the first free, cloud based antivirus from this reputed security vendor. This free antivirus is revolutionary concept in antivirus software. Advanced Virus definitions from the Clouds! Panda Cloud Antivirus is a light-weight antivirus application, connected in real-time to PandaLabs’ online Collective Intelligence servers, designed and developed to protect your PC against the newest malware while hardly affecting its performance. It is truly an install and forget antivirus software, without ever having to worry about updates and complicated decisions. 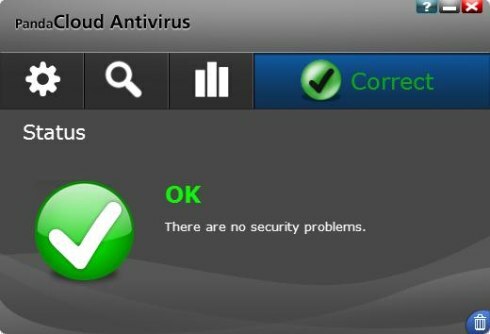 Cloud Antivirus is very easy to use and has a quick scan. It offers a Quick Scan or a Custom scan for specific folder, files, and drives, and its supporting features are exceptionally light. On opening the main window of Cloud Antivirus, you are greeted with a BIG green or red icon, informing whether you’re safe or not. This antivirus offers automatic threat management. You can get a Report of threats detected and removed from your computer for: All, Last 24 hours, Last Week, or Last Month. Despite lacking a scheduler, the program is not a bad choice for a light antivirus, running on 60MB while scanning, which is a very economical figure for antivirus software. This also makes it an ideal free antivirus for netbook. With its limited feature set, Panda Cloud Antivirus is a decent and reliable free Antivirus software. Download here. Avast free Antivirus is also anti-spyware, with a state-of-the-art scanning engine providing dependable protection against viruses, spyware and other malware. It also gives real time anti-rootkit protection, with a unique technology enabling even unknown rootkits to be detected and stopped before they effect any damage. Avast! features advanced heuristics and sandbag to keep abreast of the latest malware being released into the internet. Avast! can detect potentially unwanted programs, such as remote administration tools and commercial key loggers and custom rules to deal with them. Avast! blocks attacks by hacker and protects your identity Avast! Boot-time scanning, allowing computer-scan before starting the operating system, and before any virus-activation. Avast! reduces file scans by up to 80% through a memory of proven safe applications, unless they change. Monitors and blocks suspicious activity on your computer. Scans all incoming/outgoing e-mails for malware Scans all visited web pages and checks all files, pages and java scripts downloaded from the internet, without slowing web browsing. Checks files downloaded using P2P programs like Limewire and eMule. Silent/Gaming Mode, disabling annoying pop-ups without degrading security. Runs faster on new, multi-core CPUs Real-time graphic scanning reports. Automatically processes infected files without needing user instructions.